I didn't care much for these. 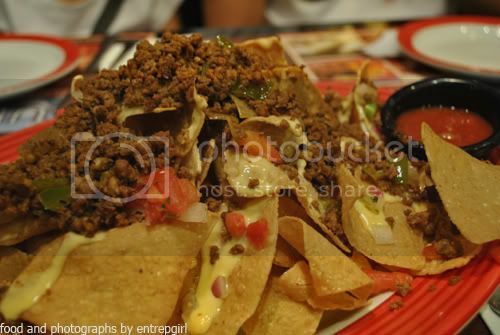 They were just ordinary nachos with meat, cheese and some bell peppers, onions and tomatoes. Frankly I didn't think it was worth the price. 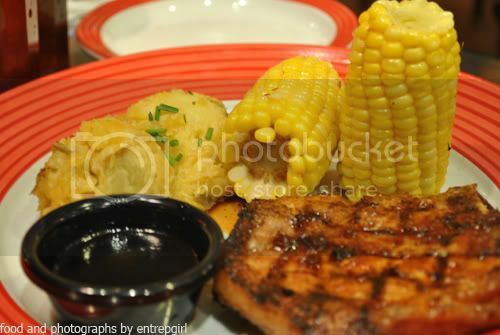 The pork chop itself was ok, not that tender though. The sweet JD sauce was good, and really helped give the meat a pleasant taste. I love, love their mashed potatoes as always, and the corn were a welcome treat. But still, they could have added more butter to the corn. It's been a long time since I've last made an entry in this blog. I've had to attend to too many different things and activities. Seeing as I don't want to really let this blog go to waste, I've decided to keep my posts pretty simple for now. 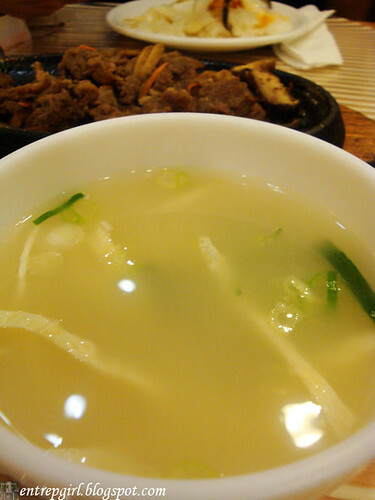 What matters to me is that I get to update it more often than before, and continue to give people a taste of a subject and activity I hold dearly in my heart -- food and eating. 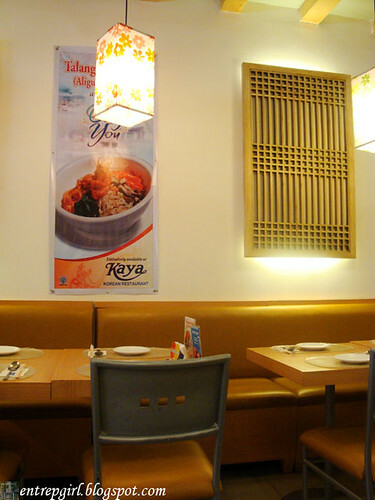 Instead of long and varied descriptions of my dining experiences, it will be more of a direct-to-the-point review if you will, of different gastronomical delights from restaurants to food stalls and everything in between. I hope you will continue to enjoy reading as I share my festive eats and may the pictures I show help shape and color your imagination as we go on this delectable journey. 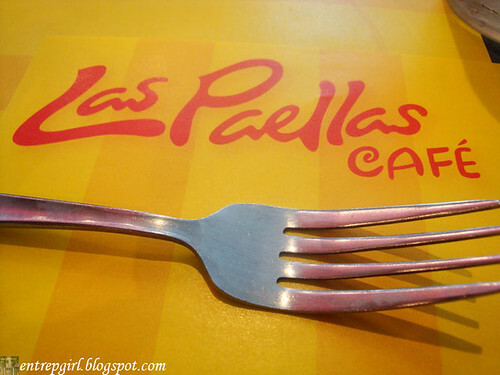 I've eaten in Las Paellas a fair number of times and I would just like to share more of their dishes that I've tried. 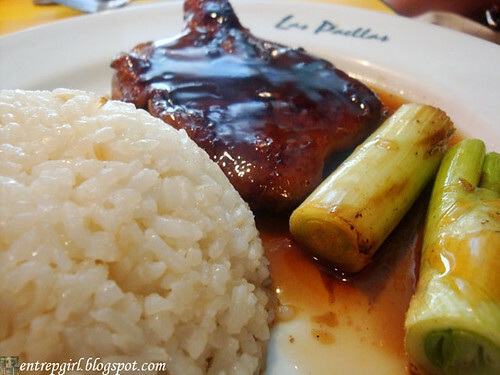 Their Teriyaki Chicken (P195) is your typical, run-of-the-mill Asian version of a chicken. The sweet sauce is good although the chicken could have been less charred. 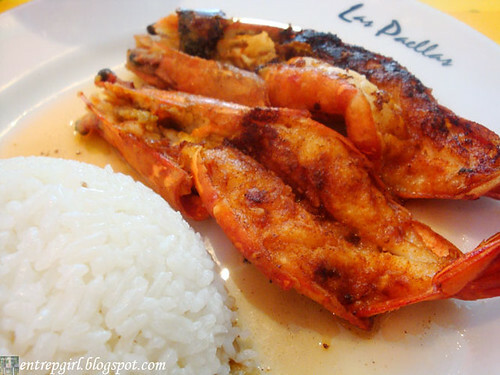 The Prawns A La Parilla (P285) were better in taste, although I expected at least three pieces of prawns for the price. Nonetheless, you could not go wrong with pan-grilled prawns in lemon butter sauce. 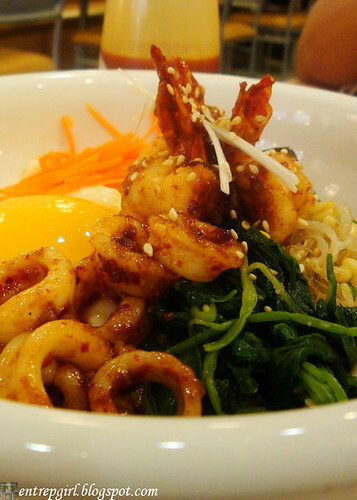 I've always loved shrimps drenched in lemon butter, and this dish leaves me craving for more. These pictures were taken from the Las Paellas branch in BF Homes. 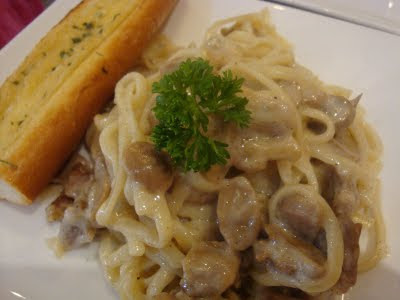 One thing I noticed though, was that they lacked garnishing on their food. 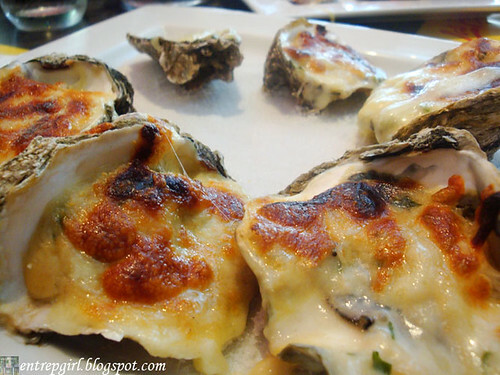 Like with the Oysters Rockefeller (P215), the oysters were simply presented in a plate, very much unlike the one we had in the Festival branch (click here to see picture) where there was a slice of lemon smacked in the middle and I'm not sure if the green garnishings were parsley, but it made the dish much more appetizing. 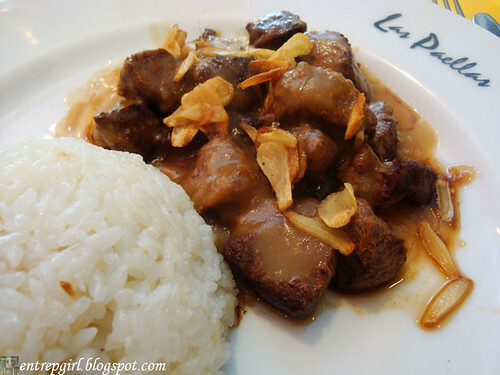 The same goes for the Salpicao (P245). 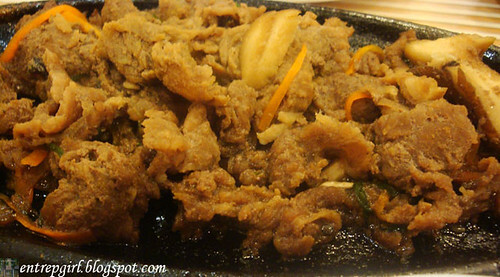 The one in the Festival branch had buttered corn and steamed vegetables on the side (click here to see picture), which really enhanced the dish, while this one in BF had none. I'm not sure though if they had just no stock of spices and vegetables that day or if they really present the food in a plain and undecorated way. 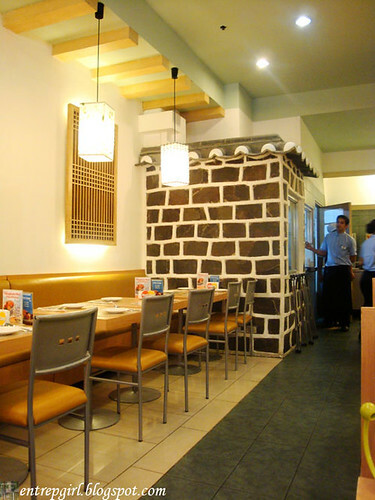 The dishes themselves were good though, so decorations or no decorations, this restaurant is still good enough for a second or third or fourth visit. I've made a post about this same event a few months ago. 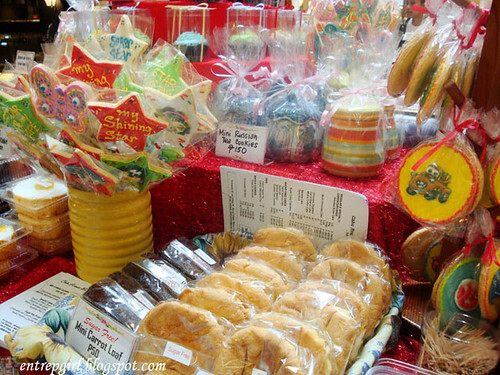 And since I haven't yet featured every participant, this time I've managed to take more photos of the pastry booths and their wares. Costa Brava features Coco Natura, an all natural and organic coconut sweetener, a sugar substitute for beverages, cooking and baking. 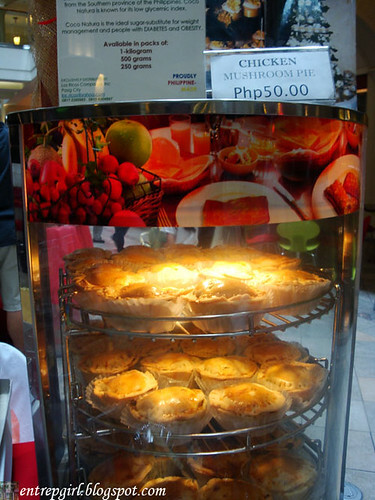 One of their specialties is the Chicken Mushroom Pie (P50). 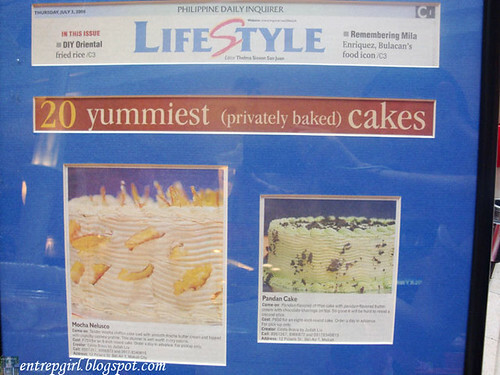 Also included in their list are different cakes and cupcakes, ensaimadas, gelatin, leche flan, macaroons, palitaw, polvoron, and a whole lot more. 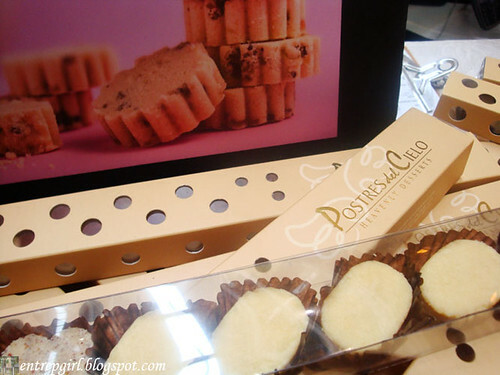 Postres del Cielo mainly sells gourmet polvoron. 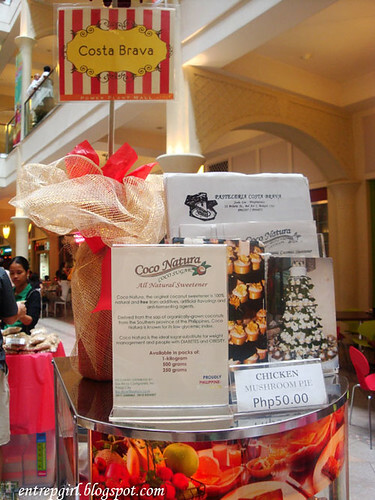 They have unique flavors like Kiwi, Cranberry, Rose & Lavender (P250/dozen). 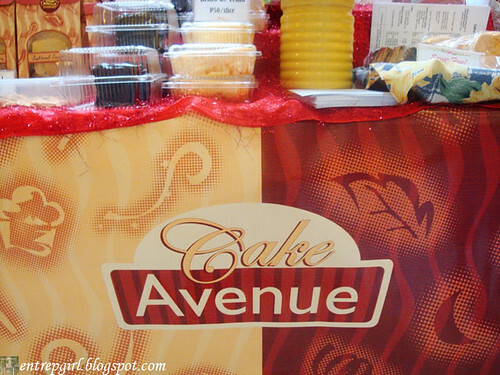 Cake Avenue creates custom-made theme cakes for all occasions, some of which are decorated cupcakes and cookies, birthday, wedding and baptismal cakes, and company give-aways. 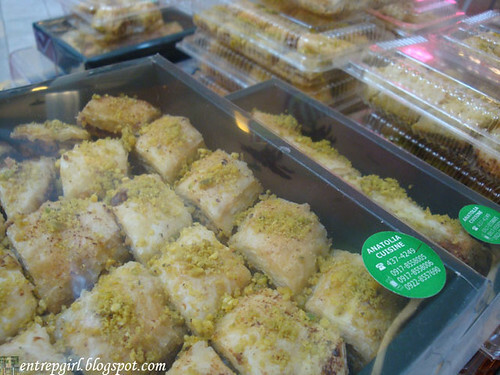 They also have special cakes and pastries like Brazo de Yema, Brandied Butter Cake, Food for the Gods, Lemon Squares, Oatmeal Crispies and Russian Tea Cookies. 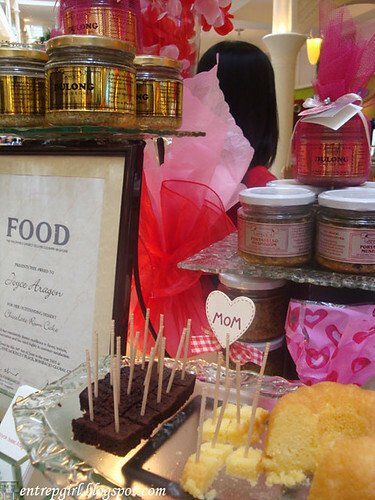 Their sugar free products inlcude Chocolate and Carrot Cakes, Fluffy Mamon, Brazo de Yema and Apple Pie. 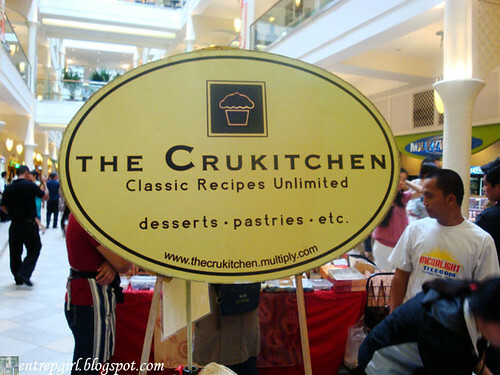 The Crukitchen offers different brownies, lemon bars, food for the gods, crinkles and cookies. 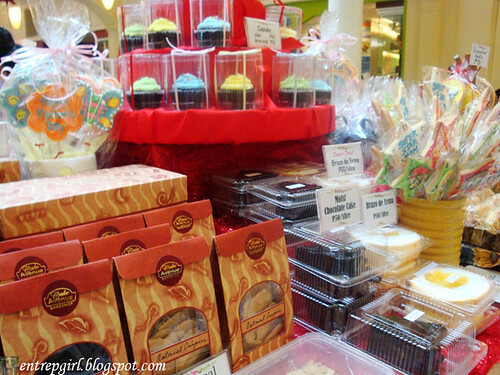 They also have specialty cakes and pies like Luscious Belgian Chocolate Decadence, Belgian Chocolate Mousse, Dome Paradise Cake, Chocolate Pecan Turtle Tart, Baked Oreo Cheesecake, Moist Chocolate Caramel Cake and Walnut Carrot Cake. Sugar free versions of the cakes are available upon request. 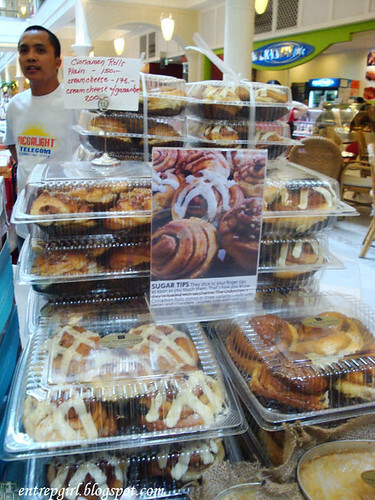 Among their bestsellers are the Belgian Creme Puffs (P295/16pcs and P200/9pcs), Cinnamon Rolls, and Lola Consuelo's Leche Flan (P150). 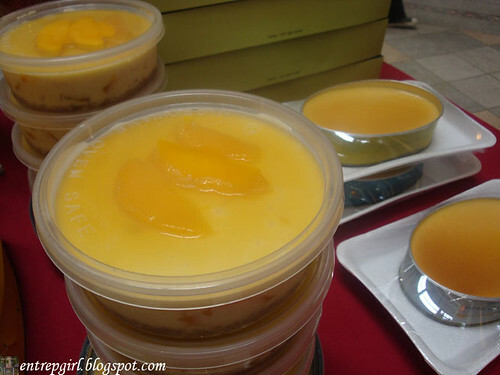 The leche flan looks rather tasty and so pretty, not too dark with the sauce. 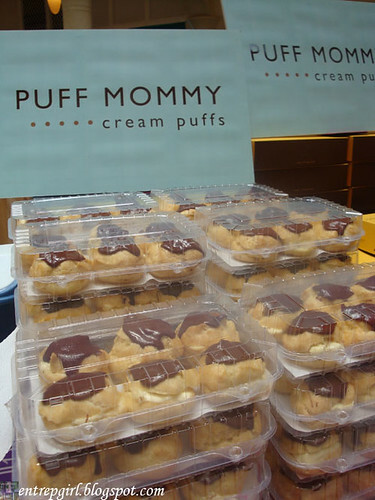 Puff Mommy basically offers cream puffs. 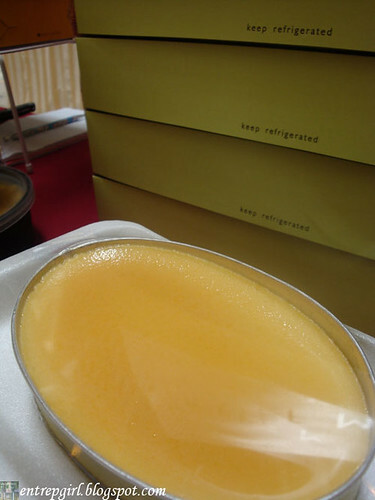 Here is one more luscious looking leche flan. 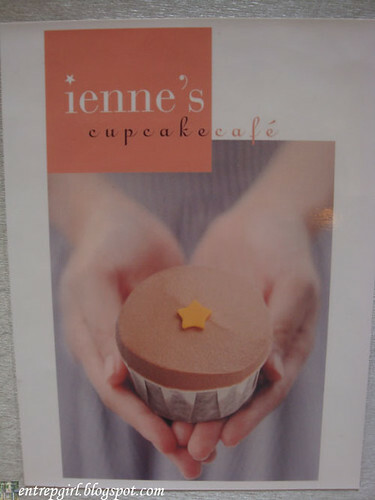 Ienne's Cupcake Cafe offers different flavored cupcakes like Vanilla, Vanilla Mint, Raspberry, Blueberry (P50) and Mocha, Red Velvet, Dark Chocolate, Passion Fruit (P55). 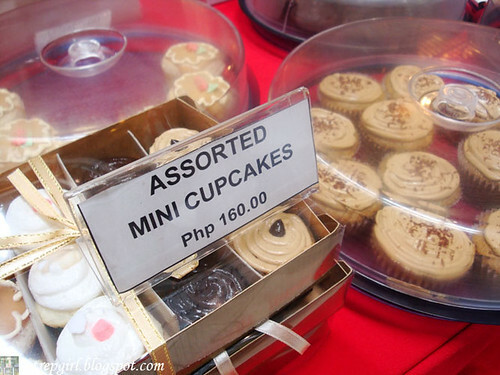 They accept bulk orders with advance notice and you can also have mini cupcakes made. 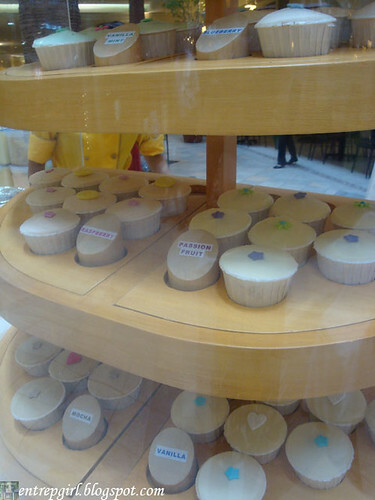 You can even have the cupcakes personalized with their available sugar decors. 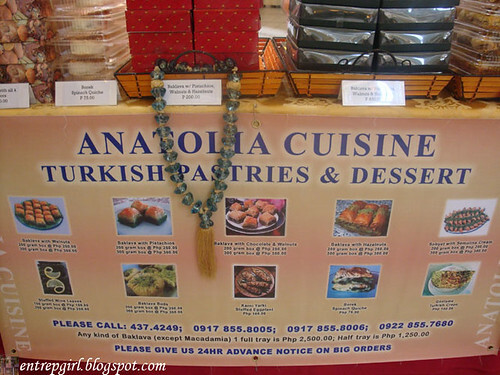 Anatolia Cuisine serves Turkish pastries and desserts. 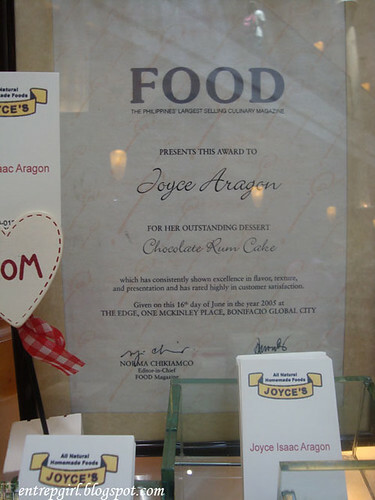 Joyce's offers all natural homemade food. 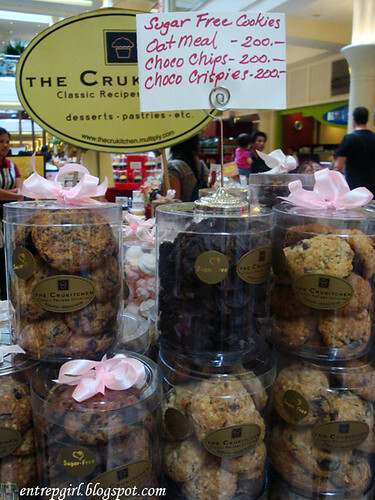 They have pastries like butter or chocolate rum cake, chewy butterscotch and oatmeal crisps. 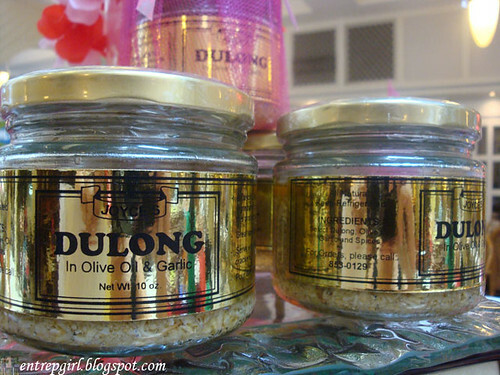 But probably their most famous product is the Dulong (P250). Tiny fishes drenched in olive oil and garlic. We've been having this for years. 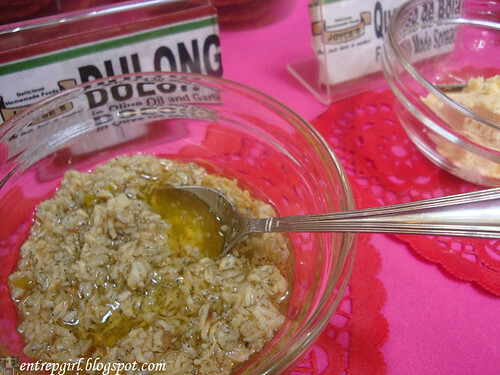 It makes for a very delicious snack, just grab several pieces of melba toast, smother them with a generous helping of dulong and pop them one by one into your mouth. Yummy! 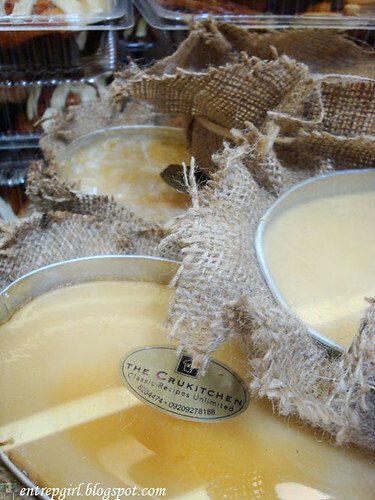 They also have Queso de Bola Spread (P280), which my mom loves, and Portabello Mushroom Dip (P300). 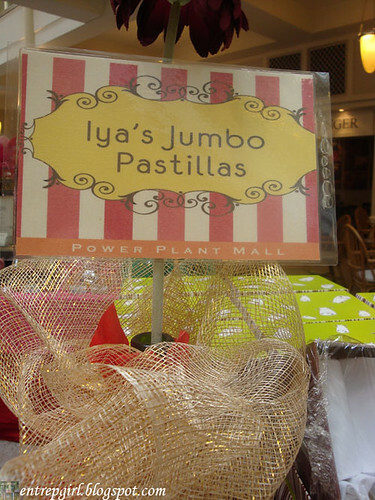 Iya's Jumbo Pastillas basically offers different flavored pastillas and lengua de gato. Erika Fortunado was a classmate of mine in high school. Every now and then, she would bring pastries to school, sharing with us her delicious creations in between classes. She is a graduate of Hotel Management School 'Les Roches in Switzerland and has also received a Pastry Diploma from 'Le Cordon Bleu in Paris, France. 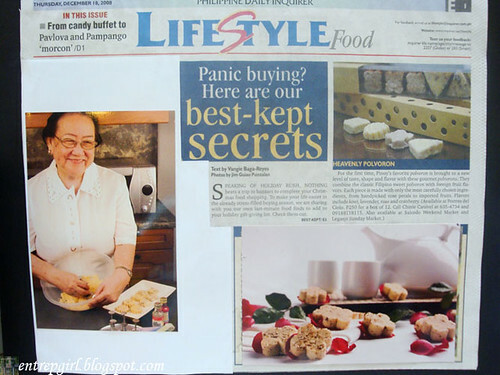 Now, she is the proud owner of Bohemia Cakes and Pastries with the tag line "We Dream in Cake!!!". Her passion for baking and flair for creating artistic and very detailed sugar pieces are evidenced by her every masterpiece. You can also visit her multiply website to see her cake gallery, which serves as samples of her work and not a catalog of her designs. All of her cakes are designed per client to ensure the uniqueness of design and character. However, if you see a design that you very much like, she can replicate it with some changes tailored fit for you. 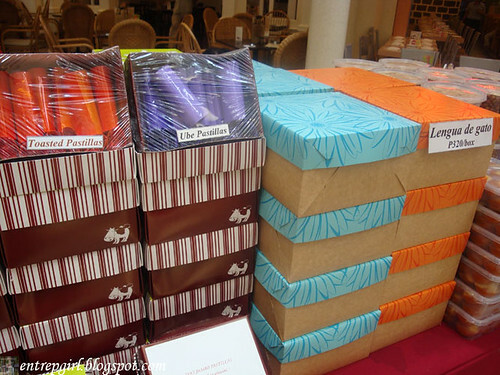 Cake prices are dependent largely on labor so there is no set pricelist. 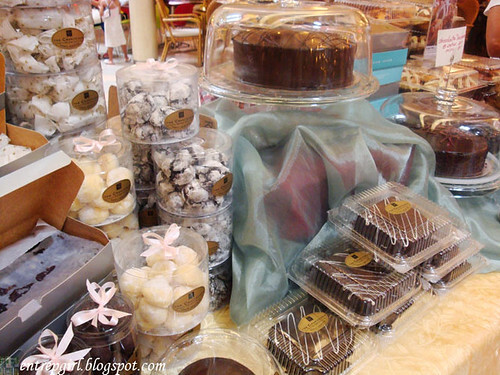 You can send your cake or pastry requirements through e-mail, which is her primary mode of communication as she could not normally take calls in the middle of designing a cake. And no one wants to disturb a master at work (when you see how particular she is up to the tiniest detail, you will very much understand why).